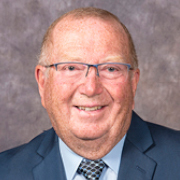 Ralph Eichler was elected as the MLA for Lakeside in 2003 and re-elected in 2007, 2011 and 2016. His 2016 appointment as minister of agriculture remains. A business owner and former administrator for the Interlake School Division, Eichler is an active volunteer in his community, serving various organizations including the Teulon and Area Lions Club, the Stonewall Royal Canadian Legion, the Interlake Community Foundation Board, and the Teulon Golf and Country Club. He and his wife Gail have three children and three grandchildren.